Home / Babymoves 4th ed. 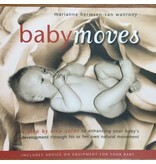 Babymoves was first published in 2002. Babymoves describes and illustrates with photos, the ideal development of babies. It explains the importance of this, and what parents or others can do to enhance it, or what hinders it. The book also includes advice on equipment for babies. It is a must have book for parents of new-borns and babies; it gives them an understanding not found elsewhere. This makes it the best gift around for new parents. Babymoves was first published in 2002. Exquisite photographs of infants are used to illustrate each movement sequence. Detailed suggestions on how to invite, rather than manipulate and instruct, the infant's self-initiated mastery in her movement are easy to understand and quite doable. This book should be #1 on the gift list for the expecting family, and in the library of those of us who work with families with children from birth to three. Author: Marianne Hermsen-van Wanrooy From birth until the time they walk, babies develop through a continuous process of replacing their innate reflexes, with voluntary and well controlled movements. This reflex integration is an intricate and essential part of the development of the human brain, the foundation for future learning and behaviour, health and wellbeing. Teaching movements to babies as opposed to letting them develop naturally or placing them in positions which they cannot already get themselves into, can disturb this reflex integration, causing long term negative effects such as poor posture, clumsiness, learning and/or behavioural difficulties. The ‘Babymoves’ concept: Instead of teaching movements to babies, we allow the baby to develop these without external stimulation. It is the ‘Baby’ who ‘Moves’. - Babymoves It is about movements the baby makes naturally. After the baby has had time and space to discover his own body naturally, he will also have developed the motor skills needed to discover or explore his environment. External stimulation such as toys placed into his hands or dangling above him, is just a hindrance to this very important stage.